Dr Scott Power Dip. Ed. is a Senior Principal Research Scientist and an International Development Officer in the Bureau of Meteorology, and an Honorary Professor in the Global Change Institute at the University of Queensland. He was a Coordinating Lead Author of the fifth IPCC WGI report and an author of the IPCC WGI-III Synthesis Report that preceded the Paris Agreement. Scott has published extensively in the international scientific literature on Pacific climate, climate change, El Niño, decade-to-decade climate variability, the Interdecadal Pacific Oscillation and historical changes in severe weather. 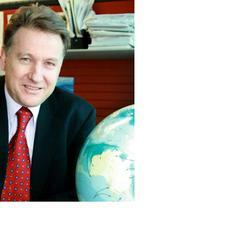 He is the former head of climate research and operational climate monitoring and prediction in the Bureau. He is also the former International Development Manager in the Bureau, and the acting head of Australia’s National Climate Centre. He previously coordinated the Bureau's participation in the Australian Climate Change Science Program, he led the development of a project to enhance climate prediction services in numerous Pacific Island countries, and he co-led a program on Pacific climate change science that assisted 14 vulnerable countries in the Pacific and Timor-Leste adapt to climate change.